Samsung's Gear 360 from last year was a pretty neat little camera. Like many similar products, it recorded 360-degree video with two fish-eye lenses. But it had a few faults - it only officially worked with Galaxy phones, and it was fairly expensive at $350. Alongside the Galaxy S8, Samsung revealed a new model of the Gear 360. Starting off with the design, the tripod mount of the original Gear 360 has been replaced with a non-moving grip handle (you can still sit it upright if you want). It's both smaller and lighter than the first model, clocking in at just 130 grams. Because it's an action cam, the Gear 360 has IP53 dust and water protection. The cameras are both 8.4-megapixel lenses, and can shoot 360-degree video in 4K at 24fps. It has a 1,160mAh battery, 2.4/5ghz Wi-Fi, and Bluetooth 4.1 (strangely not Bluetooth 5, which the S8 supports). For storage, it has a microSD card slot. Unfortunately, the camera is still limited to Samsung devices - but this time, some iOS phones are supported as well. Seriously, Samsung? No pricing has been announced yet, but hopefully it will be less expensive than the original Gear 360 was at launch. 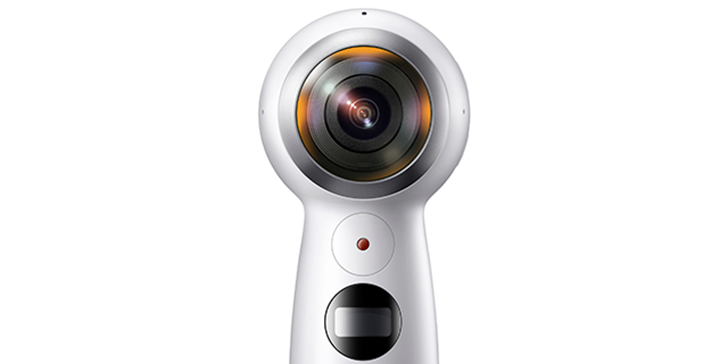 SEOUL, Korea – March 29, 2017 – Samsung Electronics Co., Ltd. today announced a new Samsung Gear 360, a 4K resolution-capable 360-degree camera with a refined design for easier use. With enhanced features for high-quality content, the Gear 360 is lightweight and compact, offering an expanded Samsung VR ecosystem.